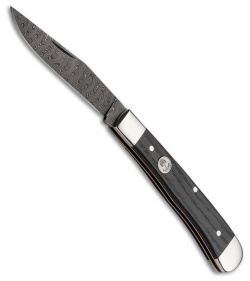 The limited to 500 pieces, Boker Trapper Classic Damascus pocket knife is an easy addition to any pocket or collection. The Damascus clip point blade with nail nick opening, is large enough to take on some of your bigger cutting tasks while remaining pocket friendly. Bog Oak wooden handles are a deep brown color with a defined grain structure and include an inlayed Boker medallion. Polished nickel silver bolsters with pinned construction ensures years of use.